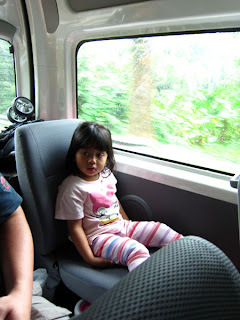 tesyasblog : Penang Transportation: Car Rental or Van Hire? Penang Transportation: Car Rental or Van Hire? As I have mentioned in my previous post, we flew with Air Asia from Jakarta to Penang. 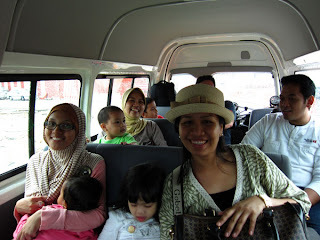 We got really early flight from Jakarta (at 5.30 am) and also early flight from Penang (at 10.30 am). Flying Air Asia has never been this excited before, and the experience flying with 6 children was just awesome! We rented an airport transfer from Bayan Lepas airport to the Golden Sands. Actually there is also a direct bus #102 which runs every 45 minutes. But it takes almost 1,5 hours. While by a private car, it is approx 45 minutes. I searched through the internet for the possible option and of course to compare the price. I checked also the Penang forum at the Tripadvisor, and read a review which recommends Ocean Jupiter. I asked them by email for an airport transfer for 6 adults and 6 children. Steven Yeap from Ocean Jupiter, answered my email saying that we can use their van for RM 100 one way. Compared to one taxi which cost approx 60-70 RM from Bayan Lepas airport to the Golden Sands hotel, of course the van option was the best. We were picked up on time, and the driver Shawn is a friendly and helpful guy. He also act as a guide for us:) We also hire the van on hourly basis which cost RM 35 per hour. 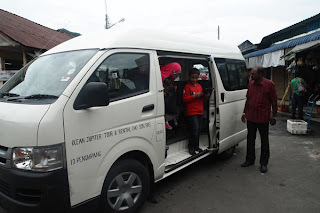 A very recommended tour to hire van or car, yo can visit http://oceanjupiter.com/ We asked many questions by email to Steven Yeap regarding our trip, and he always answer my email promptly. Thanks so much Steven and Shawn! We also tried the Rapid Penang Bus, it's very convenient. Bus #101 from Golden Sands to Komtar runs every 15 minutes. So we have never waited that long for this bus. It was cheap, cost only approx RM 1.5 from the hotel to Komtar (approx 1 hour ride). 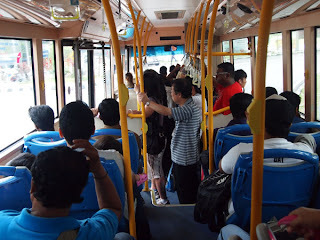 To go to several tourist spot, the rapid penang bus is also available. Visit their web http://www.rapidpg.com.my/ for more detail information.